Clear easy to use scales. 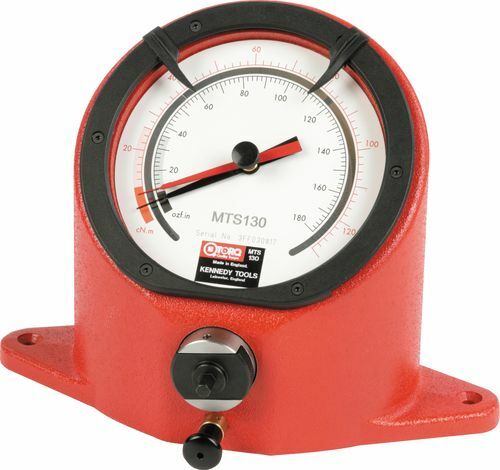 Specifically designed to set and calibrate most makes of torque tools. Mechanism is totally enclosed in a die cast aluminium housing. Repeatable accuracy to plus/minus 2% of reading. Memory pointer and built-in needle shock absorber. Single direction mechanism for clockwise use. The preferred and certified ranges of these torque calibration analysers meet the specified measuring range as detailed in ISO 6789 : 2003. Torque range: ISO 5.0 - 25Nm (44-220lbf.in). Versatile, can be used with torque screwdrivers and small torque wrenches. Easy to use, clear & easy to read dual scale dial. Enclosed mechanism designed for bench mounting. New robust and modern design includes angled dial for ease of use. Repeatability accuracy plus/minus 2% of reading. Slave pointer tracks torque, while limit pointers can be used to mark pre-set limits. Reversible drive adaptors provide two drive options - 1/4" hex female or 1/4" square male. Dual Scale ISO metric & imperial ranges. Spindle lock eliminates the need to remove tool from the drive during tool adjustment. Input drive has an in-built shock absorber to protect the Torque Calibration Analyser from tool kick back.